The most crucial lockout, barring our Round 1 starting squads, is always the Round 3 lockout. After this week, the majority of the AFL fantasy fraternity will experience their first price fluctuations, which means that this is our last chance to patch any leaky holes in our Dream Team boats. Even before we had two trades a week to play, trading before the third round was a must – we should know a lot more about the players we’ve picked with two games worth of home-and-away season data – not that silly NAB Cup stuff. As a result, this article will be saturated with trade talk, break-evens and dollar signs as we break down the best way to better/salvage your squad! J.Watson, 3 votes. Actually, that might have been Dyson Heppell (147) – but in DT terms, Jobe’s start has been Brownlow worthy. He’s currently the equal 2nd highest scorer this season (128 avg), marginally behind teammate Stanton (128.5 avg) and alongside big improver Andrew Swallow. If you need to fix up any midfield mistakes, Jobes’s the guy for you – provided you can find the $580k lying around to lure him in. It was an excellent week in the world of rookies, the fuel that keeps our DT trains chugging. Our little Portlet backmen were excellent, with Pittard (78, -63BE), Heath (74, -69BE) and Stevenson (71, -82BE) all securing large price hikes ahead of time. Add in the wise Brett Goodes (82, -102BE), and it’s safe to say that our backlines will be funding the bulk of our earlier upgrades. Proving that you can’t fake quality, two Number 1 picks in Jaeger O’Meara (mini-draft) and Lachie Whitfield became the first two rookies to top the ton this year. 102 for Whitfield is a frustrating result for owners who were dazzled by the extra dollars on offer for an overlooked Viney (59) or Wines (81), but Jaeger’s 104-point bomb has everybody smiling! My boy! JJK was one of the more traded-in players last week, and judging by the current Assistant Coach figures, he’s about to become one of the more popular characters in Fantasyland. Kennedy bounced back from a disappointing first quarter that only produced 4 points (a lonely tackle) to be the game-leader for the Eagles with 5-straight goals and 97 DT points. As I’ve said all along, key forwards will be inconsistent and he won’t be poppin’ 90’s every week – but he’s basically a must-have at this point, if only for his price increases over the next month due to his BE of -37 this week. Honourable mentions: Hanley (124), Cotchin (121), Birchall (121), Ebert (117), A. Swallow (115), N. Riewoldt (108), Minson (104), Moloney (101), Wines (81), Neade (75). So far, Patrick Karnezis is a massive front-runner for the infamous Yarran Dilemma, just slightly overtaking Toby Greene for the honour at this early stage. He has failed miserably in living up to the (possibly excessive) expectations we had for him after his pre-season – where he went at 119DT/100min, don’t forget. Then only positive that we can take out of his 9-point sub-affected atrocity is that Claye Beams was the sub in Round 1, then was rewarded with a full outing the week after. After Vlastuin and Terlich were scratched in Round 1, a structure reshuffle meant that I was on the lookout for a new D4. Hartlett, Hanley and Grimes made the shortlist, and I’m feeling pretty lucky to have steered my side in a non-Hamish direction after Round 2. Hartlett backed up last week’s 105 points with just 35 in Round 2, largely due to a debilitating back injury sustained in the 3rd quarter. As a result, he scored just 7 DT after half-time, which has the further effect of raising his BE considerably over the next fortnight. As for question marks over his health leading into this week’s Showdown, you can breathe easy – Hinkley says he’s a certain starter. Years into the future, I may consider picking Zac Smith in a fantasy side again. Until then, he’s dead to me. Like many coaches, Zmith was the stand-in for Leuenberger over the first week or two, which has just been a massive failure on every level. In fact, Blicavs – who’s literally played about seven games of Aussie Rules in his life – would have been a much better starter, scoring 8 more points over the first fortnight for just a third of the price. Luckily, Leuenberger announced his return with 74 at the weekend, making him a no-brainer replacement if you hadn’t done so already. Dishonourable Mentions: Greene (72), Robinson (75), Rich(47), M. Wright (49), Zorko (75), Ablett (84), Varcoe (56), Watts (38), K. Mitchell (19). Dangerfield was far from everybody’s favourite DTer last week, and without any large ruck or rookie issues, the remaining coaches chose to sever ties after just the one 51-point game. Barlow, Mundy and Murphy all topped the ton last week and were prime value-based replacements, particularly the Docker pair. It was well publicised that Ryder had just the 4 touches last week, whereas Kreuzer was brilliant on his way to 114, making this just another reflex luxury trade pulled by a fair chunk of coaches. I’m very wary about side-swapping Premiums based on one performance, but this one seems to have paid off early. LeCras’ broken wrist obviously forced a lot of hands with Round 1 trades, so it just a case of who you picked to replace him. Josh Kennedy (99 in Round 1) was the obvious choice, but there were thousands of coaches (literally) who either had JJK already or chose to back in Vickery after his Round 1 career-night that was punctuated with 101 DT points. Moral of the story – if you’re going to trade a Premium out after Round 1, make sure it’s to a reliable option, not a speculative break-out guy. You’re only asking for more pain otherwise. The interesting thing about all these extra trades are the strategies that coaches are coming up with to make use of them. I love seeing a variety of different tactics, as I don’t think there’s just one particular method we have to employ to be successful this season like there has been in the past (Guns & Rookies with a safe trading tact). As a result, I’m having an identity crisis – I feel like I’m an old-school DTer in a Gen Y’s body, unsure of which way to favour moving forward. Unfortunately, DT won’t hang around and wait for me to make up my mind. With price changes just around the corner, this is the week where we go into Fix-It mode. It’s our last chance to patch up those pre-season mistakes – but where do we look for salvation? The reliable-though-expensive Premiums who’ll keep churning out points for us until their last breath, or the fast-rising bolters who’ll make you wads of cash if nothing else over the few weeks? Both are legitimate strategies – points vs cash – so for every Fix-it, I’ll offer at least one replacement that suits both strategies. Exciting times at the trade table! The seasoned DT coach in me says to pull the pin on these underperforming D3’s and D4’s and sideways them to a reliable premium. Both Birchall ($456k, 44BE, 111avg) and Heppell ($439k, 34BE, 111.5avg) are on fire and satisfy the need for consistency with your backline Premiums, while Hanley ($426k, 35BE, 105.5avg) has the ability to average 90 for the year but is likely to be a bit more hot and cold than the others. These are all basically sideways options with change, with only really Birch needing a bit of capital to get over the line. Every instinct I have says that trading in Charlie Dixon ($305k, -34BE, 104avg) is a stupid idea and needs to be laughed at lengthily before being expunged immediately from my consciousness. However, even with quite modest predictions, he’ll shoot up about $70k in the next fortnight alone, not to mention the $120k-odd that you’d bank in a swap like this. Of course, the big risk is that he’ll do a ‘Vickery’ and your team will then suffer score-wise for a modest price increase which requires a further trade to fix anyway. Unfortunately, as much as I’d like to keep Toby based on the Giants upcoming draw, his price is going to plummet in the meantime; probably in the neighbourhood of $40k-plus and that’s even with a decent total in Round 3. On the other hand, Watson ($580k, 83BE, 128avg) and Swallow ($529k, 53BE, 128avg) are both scoring at will so far this year and look likes excellent Set & Forget type replacements. If money was no object, Watson would be my first-choice in years past because of his excellent consistency and the ineffectiveness of any tags against him. Alongside Luke Ball and Andrew Embley, Moloney ($310k, -16BE, 98.5avg) was a leading option as a mid-priced centreman this pre-season, and it’s paying dividends thus far. In fact, he’s the 2nd-highest scoring Lion so far this year, and he has a guaranteed price hike on the way. Who knows whether he can keep it up, but he’s been doing it in tough losses which is a great consistency indicator. If you pull this trade you can pocket almost $190k now with guaranteed growth on the horizon. Quite simply, Zac Smith has to go. He has been shockingly ordinary in the first two rounds of 2013, with part-timer Charlie Dixon showing him a thing or two about ‘development’ and ‘realising potential’. If my mid-priced ruck failed in past seasons, I’d go straight up to the best value Premium options and look for a Set & Forget replacement there – this year, it’s between Kreuzer ($404k, 31BE, 102.5 avg) and Goldstein ($408k, 52BE, 93avg) for just $100k extra. Seeing as Leuey ($234k, 74) is half the reason most coaches jumped on Zmith, it’s a simple sideways trade to get him in. If you hadn’t already pulled the trigger on this one last week, then the $70k windfall will help you patch holes elsewhere. Despite relatively slow starts by their standards, Bartel ($493k, 94BE, 97avg) and Chapman ($503k, 101Be, 96.5avg) are some of the better Premium patches for an out-of-sync Zorko ($488k, 158BE, 63.6avg). They’ll be reliable sources of points; however, their BE’s are relatively close to their average so any poor score over the next few weeks will result in a sharp price drop – making it easier for everyone else to get on board later at a discount. Trading in Justin Westhoff ($395k, -23BE, 127avg) after his 154-point score last week is something I would have never dreamed of considering a year ago, but it’s a legitimate option these days. He’s averaged 80 points for the last couple of seasons, so you’ll earn points while he sits there fattening up in your side. Assistant Coach has him pegged for a price influx of almost $90k over the next fortnight alone, which by that time will put you in striking distance of a sideways trade to Buddy Franklin (expected to be around $490k after Round 4). Holy sh*t.
My instinctive preference would be to trade Karnezis to JJK ($273, -37BE, 38) – not because I Karny is a dud, but because Kennedy is a must-get, purely for cash generation purposes. It’s just so happens that I have both – so what to do? I’m leaning towards holding, partially because he has a gettable breakeven, partially because he shouldn’t be the sub again this week and mostly because I’d rather fix up bigger issues elsewhere. If I was hell-bent on getting rid of Karnezis, Petterd ($244k, 75) would be my go-to guy. He slotted perfectly into Richmond’s defense last week, and it would avoid any probable price drop from Karnezis. This is a bit of a luxury trade though, because we don’t actually know what Petterd’s range is going to be like after just the one game. Great question. Like some of the speculative picks I mentioned above, Libba’s ($402k, -5BE, 120avg) not someone I’d ever have seriously entertained in years past. He’s just not reliable enough to be a ‘Keeper’ – someone that you’d hang your hat on for the rest of the year. 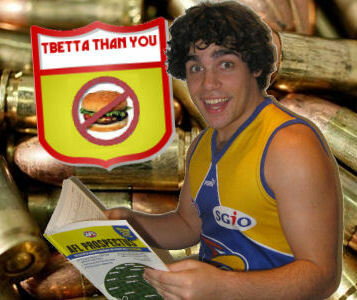 Of course, it’s a different world out there now and Liberatore is now suddenly a juicy option. Thanks to back-to-back 120-point scores, Assistant Coach has predicted him for a $60k cash boost in just a fortnight. By that time, you could simply swap him out for a fallen Premium, such as Swan/Ablett/Dangerfield/Redden, all of whom have BE’s over 140 this week. I don’t recommend doing this kind of ‘bridging’ trade too often during the season, because it requires using two trades and trading a guy in that you don’t really want, let alone the risk associated with relying on price drops on your next trade target. But we’re in a unique position this week where two scores compound for a price-rise, whereas it’s normally just the one (as prices change every week once a player has established a three-week moving average), so we’re getting double the value with these snakes-and-ladders trades. With a BE of 17, you can’t really go wrong. Monfries is a great DTer in the sense that he scores more than someone of his influence or talent probably should – plenty of uncontested +6 combos and opportunistic goals help with that. I know that sounds like a criticism but it’s really not. If you’ve got the $115k spare and already have JJK, then he could be worth a shot. Yeah, absolutely. Maybe not happy, but content is a wise choice of words. What you get with Coxy is reliability – both in terms of consistency, as he’ll top 80 every week, as well as durability, given that’s he played 73 games on the trot. He’ll score a lot better against the weaker opposition too, which he hasn’t had with Freo and Hawthorn so far. I’d be looking at the front-runner type of guys, which has pretty much been the entire Eagles midfield mindset in the first two rounds, barring Priddis. Scooter (131), Shuey (123), Gaff (117) and Masten (113) all dominated last time they played the Dees, although Jordie McKenzie went to Kerr that day. 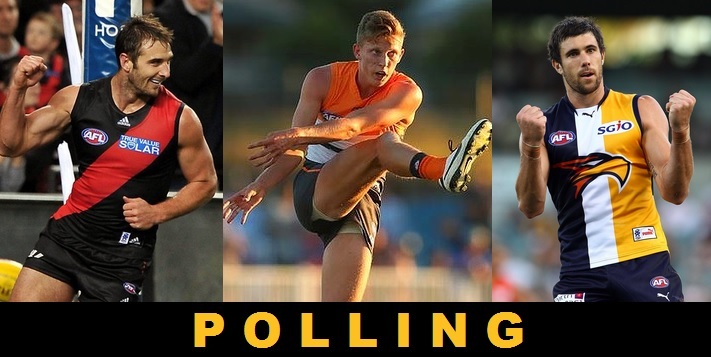 Pick one of the three that doesn’t get the tag – which is most likely to be Shuey, with a slight possibility it could be Gaff after Shiels destroyed him on Sunday. Don’t forget that not all of our players change in price after Round 3. Popular fantasy options such as Heath Shaw and Montagna have played just the one game, as has the mid-priced Petterd. The advantage here is that we get another week to look at these guys before we’d have to commit to them, and it prevents us getting stuck in a log jam with pre-price change trades. The rookies get first preference however, and I’m hardly going out on a limb in saying that Crouch and Terlich will be two of the most traded-in players next week, when they’re on the bubble and everyone else has experienced their first price change. Firstly, everyone who ridiculed me and others for not starting with Ablett can shove it. His BE is now 156, meaning he’s likely to drop $40k in the next fortnight. The question is – should you consider trading him out to a bolter like Moloney if you can? It’s tempting, but one look at the Suns’ upcoming fixture has me transfixed; over the next 6 weeks, they play the Lions, Port, GWS, Fremantle, Melbourne and the Bulldogs. Only the Dockers are finals contenders of that lot, and although Ablett doesn’t need to play easy opposition to score well… Surely it gets easier? Where have all the gun forwards gone? That’s right, Beams, Sidebottom, Dangerfield and Zaharakis all lost their DPP last season… It’s a far cry from last year, where we were spoilt for choice up forward. 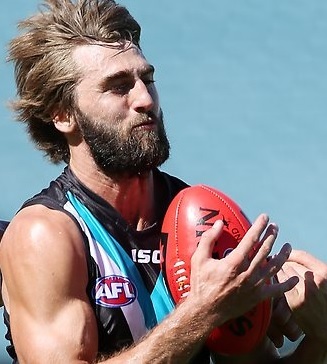 I mean, Westhoff is the only forward currently averaging over 100?! I can’t be the only one who’s unimpressed with the lack of choice down there – as a result, I’m considering pursuing a cash grab for Zorko until Thomas/Stevie J/Wellingham are fit and firing again. For those who are getting involved in fixture trading tactics (worked well for N. Riewoldt owners so far, not so much for Swan midfielders though), you’ll want to keep an eye out for GWS, Gold Coast, West Coast and Brisbane players over the next month. It’s for this reason that I’ll be keeping Scooter, for example, as the Eagles play Melbourne this week (who would he even tag?) then Carlton is the only finals contender that they facein the 6 games after that. Well, that’s all from me this week! Given that this week is the most crucial week for trades all year, I tried to fit in as much as I could. If I didn’t help solve your problems, hit me up on twitter at @Tbetta9. Until then, let us know whether you’ll be going old school or YOLO with your trades this week in the comments! Tbetta, you tick the boxes mate. Consistency, durability – and the CEILING… favourite article of the week bar none. Murphy and Scooter are the supporting cast for Swan, GAJ and Pendles in the mids for me. I’m really tempted to use my 90k reserve on one and bring Jobe in this week. Trade 2 would be Karnezis or Patton to Dwyer. 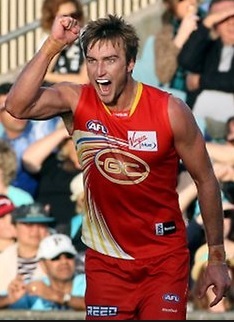 Pull the trigger for Jobe or back the boys in? I would recommend, pending selections, Patton out for Dwyer in. Karnezis can still make his BE and Patton will not net you a lot of cash/points. Opions & Views greatly appreciated …. I have Josh Kennedy (mid) not doing well trade to Watson and trade Zorko to Westhoff or N.Roo? u dont have any other problems bigger than jpk? Keep Matthew Wright? Or trade him? He has a lot of scoring potential but I’m scared he will keep being used as a tagger. Swan and Karnezis OUT. Liberatore and Westhoff IN. I dont have any problems to fix yet other than Karnezis. SO next week I will reverse the trade. Swan back in after price drop and I will have about $400,000 to replace Karnezis with Cox from the ruck and Kreuzer in to take R1! Dude, that’s crazy. Don’t do that! Swan is really going to tear it apart in at least two of the next 3 games. He got 165 on Hawthorn last year and plays Essendon in Round 5, where his last 3 scores have been 187, 171, 171. I’m sure you’ve got some rookies like Kane Mitchell or other underperforming premiums that you can use trades on. You’ll be sorry for trading out Swan…. But Richdogg. He will back in next week. Only miss the hawthorn game. Liba should get a 100. So small risk. Big $100,000 reward. See my thinking? I can see what you are thinking, however I don’t think it’s quite a 100k reward. I believe it’s a bigger risk than you think but can kind of see it working. Just assess weather you have other premiums with higher BE’s if you want to pull a move like that. But with more diplomacy…Moonrat I see your thinking but I disagree with the soundness of your decision making however if you insist then by all means proceed. Good luck. Would you take the chance of getting rid of swan if your opponent this week has him as captain?? I think not!! While I see the point of doing this to generate cash, you are losing valuable points. If you want to get in Westhoff for some cash find another way!! That’s taking crazy to a new level. Dude you should never dump The Pig NEVER !!!!!! For what it’s worth, theoretically if you dropped Ablett last week for Dwyer you’d be 6pts and 600K better off right now. Don’t think you can call the idea stupid BEFORE the games have been played. You can play the odds and consider it stupid, but only time will tell if this pays off. Moonrat, give it a crack! If everyone says it’s stupid and they’re wrong, you’ll be ahead of the curve. I have friend who was top 100 the first 2 weeks last year and dumped Swan for a cash grab. He never recovered. Have 333,300 paper in the bank, upgrade vlastuin to birchall to give me 4 premo defenders, then downgrade karnezis to dwyer leaving me with 174,800 next week to upgrade patty to swan or watson, and get rid of robinson or zorko depending on who underperforms. Dwyer move looks good too. Bucks likes him. Upgrade to swan/watson a no brainer! Swans midfielders not firing….What about Kieran Jack! 2 solid scores averaging 114! Really happy for picking him over JPK so far! GWS and GC mate. Dont get too carried away just yet! I like Jack. Just not sure he’s a DT gun! Agreed! JPK has been a surprising let down! ROK been good too though! the smart ones will have gone jack over kennedy based on past peformances against gws and gc, now its kennedy’s time to shine. for me though, i wish i started with parker! Who is writing the AFL fantasy latest advice! Crap! im holding hartlett, (but if i had three trades i probably would) one bad week everyone can have, hopefully he recovers from injury complaint and smashes another 100.
but yep, dr dt or whatever he is called now, should follow in Cameron Schwab’s foot steps! Just made my trades. Toumpas > Neade and Karnezis > Moloney, it means missing out on Wines, but that’s a risk I’ll have to take. that trade is like your name, why would you not want wines? +1. You must enjoy your fine Wines. Drink it down. Will go up $70 next week. Not sure Moloney will be a keeper. But both he and Neade will make you good short term money though! But I reckon WInes will make better long term cash. wines is a must over moloney AND neade. ur call tho. 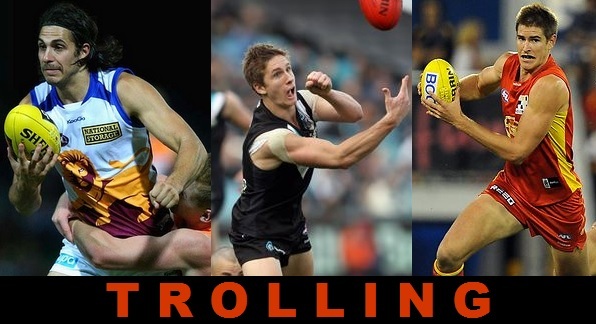 Zorko to Kennedy and Danger to Watson. Don’t like to trade premiums but Grimes unlikely to score well given how bad the Dees are and I think that Watson is shaping as a must have who’s likely to be more consistent than Danger. The thing with underperforming teams is that the game is often played in their defensive half. This in turn means that the defenders have elevated possessions, sometimes not of great quality but in DT terms we care more about quantity than quality. IMHO I’d be holding Grimes even tho Birchall is a fine choice but in most teams they would be occupying D2-D3 slot so not much difference either way, save a trade and fix your Karnezis and Zorko if that’s what you are set on. Thanks mate, that’s actually a good point. Grimes was pretty good week one. These increased trades are dangerous….I think I’m trying to do too much too soon! 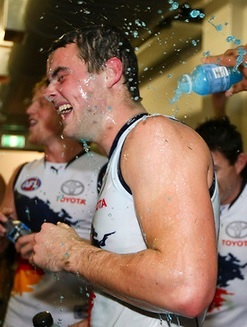 Will fix up the two Brisbane boys first…Karnezis may improve but I don’t want to miss out on Kennedy. I could perservere with Zorko, but the first two weeks have done nothing to ease myI fear that with Maloney, his midfield time wil, be much more limited. Maybe leave Watsom until he has negotiated the Crowley tag! Then definitely grab him. Although he still goes ok with a tag. But it is Crowley. Keep Kommer/Jones this week though to get pay rise. Get Crouch next week! Tbetta best article for the week without a doubt. Interested in your opinion on karnesis. I have the 4 premo fwds, JJK and karnesis, with dwyer and Caf rounding team in fwds. i missed out on Neade. With no obvious issues with team (aside from underperforming danger and zorko) i was thinking that i would trade karnesis to Neade as he is a must have fwd rookie. Will generate cash (150-200k one would think), which of course is the name of the game… in a full strength Lions outfit with Black still to return i cant see Karnezis going much above 65-70 and he wont be generating cash any time soon at least until rd5/6) with the 9 in his rolling average. thoughts? I’m in the same boat, except I don’t have Dwyer instead of Neade. It’s a concern, but Karnezis isn’t a priority BE concern yet, whereas other players in my team are. As a result, I’ll be fixing them up first, as I’m pretty happy with my rooks (Dwyer surely dropped once Beams/Thomas/Ball/Fasolo all fit). With Neade… not sure he’s a must-have (didn’t score fantastically in the NAB), but he’ll make you some early coin. It all comes down to priorities, and what other stuff you might need to fiddle with in your side. Something else to keep in mind, is Karnezis is likely to be peaking in price right around the time you’ll want to start cashing in some of the rookies. Worth getting in Stevie J yet? theres a chance he could play Carlton this weekend. Have the cash to straight swap him out for Zorko. Also should I wait till after St Kilda’s easy run to go Geary to Birchall? Zorko could smash it this week against Gold Coast then he has Melbourne so I would probably give him one/two more weeks to prove himself. I think definitely get in Birchall as he is a proven gun while Geary is just too much of a risk. i have 164k in the bank after going zac smith to burger which leaves me with 1 trade left to use i have karnezis but with his next 2 rounds (gc and melbourne) im happy with keping him i also have varcoe which im not sure on?? thoughts?? And lastly i have zorko what should i be doing with him? maybe go to a westhoff then trade out after round for a dale thomas like player? Please let me know on what you think i should be doing? Would you go to dale thomas if he is named this week? Im in a similar boat. The decision wouldnt be so hard if Brisbane had a hard draw the next couple of matches!! Good move to trade him out.. he seems to be FT in the forward 50 these days. Kreuz/Griffin/Goldy would be a good replacements or Minson as a POD. If FWD, NRiewoldt or Dusty. I am thinking along the lines of kreuzer. will minson keep up consistency though? Minson can be a good POD though. He is a consistent 80-90 player I have Kreuz in my lineup as he plays like another mid. Yep, Baily and Hale have been playing in the same team. Although it might be a good idea to see who gets named this weekend. Baily came in for Lake as a late replacement and Lake is fit again, so who knows maybe Baily or Hale go out for Lake and Roughead goes back to his old role? Bailey wont be dropped anytime soon…….highly regarded by Hawks.Very good tap ruckman and elite runner…if his body holds up. If you’re worried about losing value then trade him out.. otherwise No. He can produce 130+ scores like any other premo mids. Im not worried about it to much because i have 164k what should i be doing with zorko though? Ive got Zorko too.. but vs GC is too tempting to NOT trade him out. If we had 3 trades a week, he’d be my 3rd trade. If you haven’t got any weaknesses to patch up.. like getting any cash cows or upgrading midpricers to premo then look into trading Zorko. Maybe NRiewoldt vs GWS?? What are peoples thoughts on these trade options? Bringing in Kennedy and dumping Karn will happen regardless. Really want Hepp as he looks to be a must have in the backs, Grimes is good but Capt of a terrible team which may take a toll on his future scoring?? Not sure on option 2 as a Cox & Berger combo should be reliable but if Kreuz keeps this average up and avoiding the big Zorko price drop should make option 2 the better trade just not completely convinced. So effectively Zork –> Kreuzer vs Grimes –> Heppell. If Kreuzer’s form is legit than he may average 90+. In the long run I reckon he and Zork may average similar. So there’s a bit of value to be made. Pretty much the same story with Grimes and Heppell. Being in a far superior side will greatly advantage Hep. I reckon all in all, there’s more value potential in the Zork –> Kreuz option, but also more risk, because you have to trust Kreuz to keep his form going. Andrew Swallow or Brad Ebert? considering bringing in a rookie on the bubble… between Whitfield and M.Jones. wat are peoples thoughts regarding JS, scoring potential, cash potential etc… i already have omeara, wines, viney. I’d pick whitfield over MJones. Whitfield has a higher scoring potential hittin the ton and has a higher cash potential.. both equal in JS. Not much data to support trading in Mullett except his strong start this season against the Pies and Cats. Thoughts? Is Mullett a good option so that I can trade Varcoe for Rockliff? overloading your mids with premos is probably the right tactic going around right now… with the underperforming forwards.. the game difference will be the battle of the mids. if you’re looking to get Rocky.. getting rid of Danger for a midpricer wouldn’t be a good move. Thanks for your advice. I’m still tempted though, given that I would still have Swan, Ablett, Pendles, O’Keefe, Moloney, Mullett, Wines, O’Meara, Whitfield and Viney as mids. Without Rocky, I would have Franklin, Pav, Martin, JJK, Varcoe, Patton, Macaffer and Neade – pretty thin after the first four. Somehow I think I need to get Varcoe out and Rockliff in but can’t do that without downgrading a mid. Maybe I should just trade Varcoe out and Dwyer in to start with and then look at improving my midfield. Still wondering whether or not to keep Dangerfield. Maybe he has just started slowly this season. Keep Koby Stevens? Or trade? Just worried he could keep getting vested. Because he is only 200 grand, and he scored so quickly when he came on, I’m keeping him in my team. He could be a good upgrade target for Varcoe or Karnezis in a week or two, but getting him any sooner seems risky. Wouldn’t you rather see how he goes first (and if he even plays)? Hey guys, I’m making a trade to either Watson and Cotchin and I actually think Cotchin might be a little bit better of an option, considering there is so much similar between the two, but Cotchin’s record against the Dogs is better than Watson’s against Freo this week and a good introduction to the team would be nice + they both can break a tag and Cotchin is a R11 bye, different to Watson, Swan, Ablett, Pendles etc. sound like a good option, even though clearly they will both smash it this year? They should both be awesome, but I have a feeling Watson might be better. Kane Mitchell or Nick Kommer to Crouch? Mitchell unless he is going to get a full game this weekend. Kommer will still go up in price even if he starts as the sub. How much will cox score this week? I am trading zorko for cox (points) or westhof (cash) don’t know which will pay off.. Fairly dumb week to be trading in Cox – largish breakeven I think? Wasn’t he supposed to be dominating with NicNat out of the side? do you have chappy bartel and rocky who would all be better options than cox? Now I have an issue in my fwds. I’ve got Karnezis so I can either upgrade him to J.Kennedy or Westhoff (westhoff only for cash – he’s obviously not a keeper). Just wondering which one is going to make more money. I also have Robbo and am thinking about offloading him for either Westhoff or J.Kennedy as his BE score is 184 or something ridiculoous like that and then keeping Karnezis. What do people think? Do I get Westhoff or Kennedy? And who do I trade? Robbo or Karnezis? Kennedy definitely. Will make you more cash. Get rid of Karnezis. you didnt put robbo in your side to make you money. You put him in your side to make you points (as a keeper). Cheers mate, was beginning to come to the same conclusion. The whole reason I got Karnezis was to make money which I can do now with Kennedy. And yes Robbo is a keeper even though his price is going to fall. Was thinking Kennedy to Maloney, and Karnezis to Kennedy which will leave me with 199k in the bank for next week to upgrade a couple of players. Thoughts on these trades? Or are there any other obvious holes I should patch up first? Another option if Karnezis is named to start this weekend is Patton to Dwyer to free up some more cash. should i trade out varcoe for petterd?